A great dish for the whole family and a good way to get your vegetables in. Stir the soup and sour cream in a small bowl. Spray a 10-inch skillet with the cooking spray and heat over medium-high heat for 1 minute. Add the onion and cook until it's tender. Stir in the turkey, 1 cup tomatoes, chiles and 2 tablespoons soup mixture. Spread 1/2 cup soup mixture on the bottom of an 11 x 8-inch shallow baking dish. Spoon about 1/4 cup turkey mixture down the center of each tortilla. Roll up the tortillas and place seam-side down in the baking dish. Spoon the remaining soup mixture over the filled tortillas. Top with the cheese. Bake at 350°F. 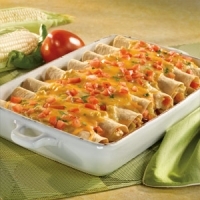 for 25 minutes or until the enchiladas are hot and bubbling. Top with the remaining tomatoes and the cilantro. WOW this looks different. I love Endchiladas. "FIVE FORKS"